“Wolf Girl” is a self-portrait made particularly for UCLA transfer submission. It has been such an amazing experience! I used to work with ink pen before, but this was a full on serious business. There was no room for mistakes, so I had to move slowly – one flower/tree/feature at the time. I liked it so much that I have decided to make a calendar and publish it in 2016. So stay tuned! 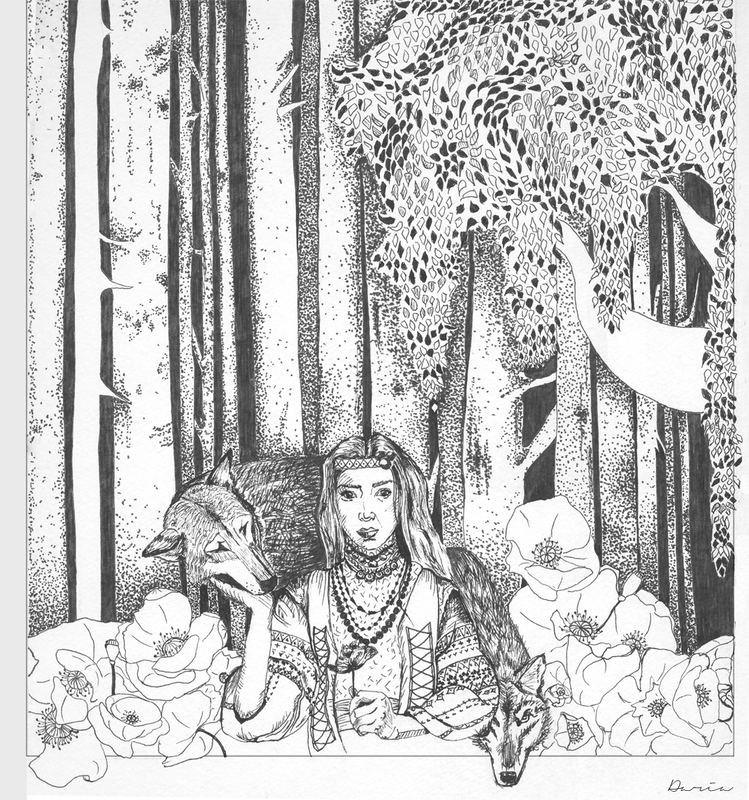 In the illustration I am in traditional Ukrainian outfit surrounded by wolves. I think that wolves are majestic and beautiful animals and they have a special place in my heart. I often apply wolf analogy to my mother and my loved one, hence the analogy is in the drawing. There are poppies in the foreground, which is an unofficial symbol of Ukraine. There is a saying that anywhere a soldier shed his blood – a poppy would grow. Poppies are growing for killed fighters of war. There is forest in the background and that is a place where I feel most at home. For me forest feel like magic. Every second something happens, if you pay attention. And I believe that all forests are enchanted.